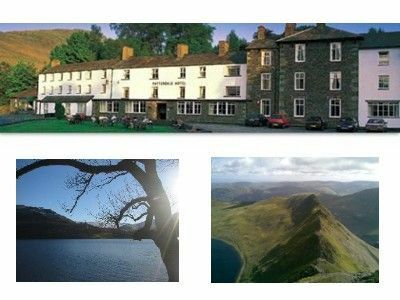 The Patterdale Hotel is in a beautiful location near Ullswater and Helvellyn in the Lake District. The hotel offers excellent value for money hotel accommodation with ensuite rooms, comfortable lounges and home-cooked food. Ideal base for walking. The Patterdale Hotel is beautifully situated in the small village of Patterdale, near Glenridding at the southern end of Ullswater. The hotel offers comfortable accommodation and excellent food at affordable prices and provides the perfect base for walking and exploring this beautiful part of the Lake District National Park in Cumbria. All our hotel rooms have comfortable beds, private bathroom and guest toiletries, colour television, tea and coffee making tray and direct dial telephone. In addition the rooms at the front of the hotel benefit from panoramic views towards Ullswater and across to Place Fell. The Place Fell Inn Bar offers the perfect place to relax after a hard day on the fells, and our head chef and restaurant staff offer the very best in excellent food and catering. Patterdale is surrounded by some of the most beautiful fells in the Lakes. Helvellyn is close by, with its sister peaks including St Sunday Crag, Fairfield and Dollywaggon Pike. The hotel looks out over the majestic Place Fell, as well as High Street and the less well known but enchanting Eastern Fells. Ullswater is rightly viewed as England’s most beautiful lake and visitors have a range of activities open to them, from travelling across the Lake aboard the famous Ullswater Steamers, to sailing, canoeing and kayaking. There are also a huge range of visitor attractions close by. Moutain bikes are also available to hire from the hotel. The hotel is also well placed for visiting the main Lake District’s towns and villages, including Windermere, Ambleside and Keswick. For more information or to book Patterdale Hotel near Ullswater and Helvellyn in the Lake District, please click on the 'Visit our Website' or 'View Availability' links above. The hotel is ideally located in the centre of Patterdale, at the foot of Helvellyn and just down the road from Ullswater. The perfect place for exploring, Sailing, walking and relaxing in this beautiful part of the Lake District National Park.